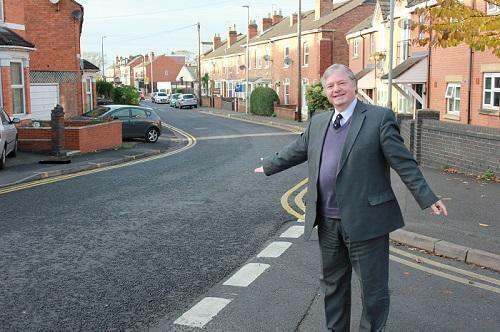 Cllr Alan Amos, Cabinet Member with Responsibility for Highways, visits one of Worcestershire's roads. It's official! Worcestershire's roads are amongst the best in the country, that's according to latest figures from the Department for Transport (DfT). Main roads in the county are ranked amongst the top 25% of all local authorities in England. Worcestershire's B and C roads have also been judged to be amongst the very best. Worcestershire County Councillor Alan Amos, Cabinet Member with Responsibility for Highways, said: "You only have to travel to some of the counties close to Worcestershire to see how good our roads really are compared to the rest. I am delighted that the quality of our roads is being recognised by the Department for Transport. But I am not going to allow us to become complacent. The quality of Worcestershire's roads will continue to be a priority for us. We are investing millions of pounds into reducing congestion and an additional £12 million into our Driving Home programme." According to the latest transport statistics, published by DfT, Worcestershire County Council treats considerably more A roads than the national average* . The Council has also treated more kilometres than the national average when it comes to the rest of the road network. All local authorities across England monitor the state of their roads. It is done through a combination of hi-tech machines and visual surveys to show where maintenance work is required. These findings are then reported to DfT from which local council league tables are produced. In Worcestershire there are over 4,000 kilometres of roads. Of these, around 14% are A roads, almost 10% are B roads while the county has more than 1000 kilometres of C roads which are made up of country lanes and roads on housing estates.